Welcome to another Frivolous Friday post! 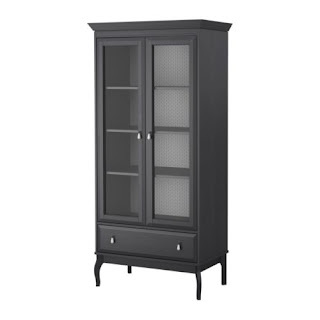 I've been jonesin' for this linen cabinet from Ikea for quite awhile. The simple lines are much more appropriate for our modest farmhouse than most frilly Victorian pieces. At a whopping $499, this is way out of our price range. At some point, I might try to bang together a similar something if I can find a suitable wardrobe or cabinet at a thrift store. With our bathroom reno plans finalized, I think we'll even have room for a linen cabinet! Hooray for storage!